Please Note: We are one of three boat companies at the Stony Creek Dock. Each boat tours the Thimble Islands. Each boat has a different web-site and phone number. Each boat has slightly different route. Each boat is different in size. Each boat has a different schedule and price. Each Thimble Islands Cruise goes by the boat name! But there is only one Sea Mist! WEATHER: RAIN WE ARE CLOSED / HIGH WINDS – CAPTAINS CALL ! SAFETY IS OUR FIRST CONCERN ! Last tour OF THE SEASON Oct. 14th 2019 2:PM Sunday! PUBLIC TOURS / PLEASE NO COOLERS OR ALCOHOLIC BEVERAGES CAN BE BROUGHT ON BOARD ! No pets allowed unless they are a service dog! GENERAL BOARDING IS ON THE HOUR. WE DEPART QUARTER PAST EACH HOUR. RESERVATIONS (Tours) : Accepted for 10 adults or more *Must be confirmed with office staff . Reservations will be called on top of the hour. If reservations are not on time, public boarding will commence. Please arrive with the full reservation by 15 of the hour. NOTE: Reservations do not guarantee seats on the upper deck! A 10 adult fee will be collected if children are among the count of 10, Must be 10 adults. SECURITY ON PUBLIC TOURS, PLEASE NO: KNAPSACKS, COOLERS, SUITCASES, LARGE BAGS, BOXES ETC. 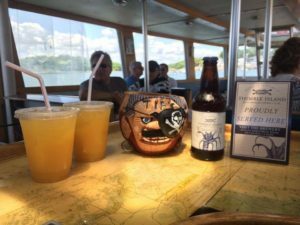 NO COOLERS OR ALCOHOLIC BEVERAGES CAN BE BROUGHT ON OUR TOURS. AVAILABLE ON BOARD: SODA/ WATER/ ICE TEA / BEER / WINE / RUM PUNCH AND SPIRITS ! ATM located at the Stony Creek Market – 178 Thimble Island Rd. WE OCCASIONALLY DO GROUPS THAT FILL THE BOAT AND INTERFERE WITH OUR REGULAR SCHEDULE .PLEASE CALL OR CHECK THIS WEB-SITE FOR ANY CHANGES. CHANGES WILL BE POSTED BENEATH THE MONTH. Look for the SEA MIST, the only BLACK & WHITE boat with the UPPER DECK and the PIRATE FLAG.